File Name: Sebastian Bludd of Sydney, Australia. Notes: Australia's largest city, Sydney is misspelled Sidney on Bludd's first several filecards. Notes: Sunbow's Maj. Bludd wore his 1983 outfit but with white or light grey chest armor, gloves, and boots. His dog tags were absent, and his helmet was various shades of blue or dark grey. The collar was usually blue. Also, his armor covered the whole right arm except the elbow. Despite fan theories that the arm is artificial, his bare right hand is visible in Cobrathon. Early ads for Marvel comics gave him blue armor. 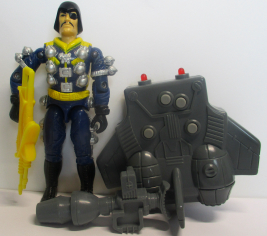 In the DiC series, Bludd wore his Super Sonic Fighters outfit, but that figure's jet pack never appeared on the show. The Revenge of Cobra, Part 3 60 seconds 9 lines on H.I.S.S. leading team to Palace of Doom, retrieving component in C.L.A.W. The Pyramid of Darkness, Part 4 19 seconds 2 lines activating cube at Mountain of Glass, leaving in a H.I.S.S. Cobrathon 14 seconds (silent) operating "one-armed bandit" during telethon; escaping in a F.A.N.G. Accessories: black rocket launcher pistol (new), black notched backpack with three engraved rockets (new). Bludd received initial military training in the Australian Special Air Service. Later joined the French Foreign Legion. Worked as military advisor in a number of countries and is currently wanted for crimes in Rhodesia and Libya. Proficient with every form of infantry weapon in current use. Bludd has a tactical mind like a steel trap. Qualified Expert: All NATO and Warsaw Pact small arms. Major Bludd writes poetry...badly: When you're feeling low and woozy/Slap a fresh clip in your Uzi!/Assume the proper firing stance/And make the suckers jump and dance! (from The Attica Gazette). Note: A few filecards give a less violent poem, as follows: A mercenary's job is a heartless one/I'm a soldier for hire like a pawn-shop gun/My ruthless tactics keep you on your toes/'Cause I fight 'em all, whether friends or foes! Toy Notes: Originally available via the Free Mercenary mail offer, which required receipts dated Jan.-Feb. 1983. Featured in the F.A.N.G. commercial. Despite occasional rumors, no straight-arm version of this figure was ever released. Bludd's right arm is only articulated at the shoulder; whether this is armor or a bionic piece is a matter of ongoing debate. Reissues: Released in stores as part of the spring 1983 regular carded figure assortment (Item #6426). Also reissued in mail offers 1985-1988 (Get Your Gear, Operation Freedom 85 and 86, Doomed to Defeat, Chilling Events, End of Slaughter). Accessories: grey or silver "Weapons-Jamming Sonic Disrupter Cannon" with large detachable muzzle (new), yellow "Multi-Burst Pom-Pom Laser Rifle" (new), giant grey sonic flight backpack with large jet engines (new), black figure stand (common). MAJOR BLUDD is a total mercenary slime who would think nothing of renting out his own grandmother as a tackling dummy. Wanted on three continents just on general principles, he is adept with plastic explosives, long-range sniper rifles, garrotes, blunt instruments, poisoned ice picks, Saturday Night Specials, and anything with nasty spikes sticking out of it. When he heard Cobra had invented the ultimate in sonic weapons, he promptly went out and stole his own private arsenal. "Major Bludd writes really bad poetry. Rhymes that get rejected by PRISON newsletters, limericks that miss the beat, haiku with sixteen syllables, and free-form couplets about assault rifles and bayonet lugs. 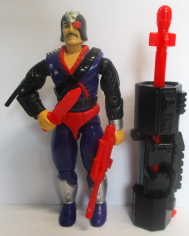 Those who have received manuscripts from Major Bludd would have preferred letter bombs..."
Variations: Some figures came with a silver cannon instead of a grey one. Toy Notes: Item #6599. Concept art suggests that this Maj. Bludd was originally considered for the Eco-Warriors line. Accessories: red machine gun (92 Destro's), red rifle (90 Rock-Viper's), black spring launcher with dark red trigger (93 Astro Viper's), two red missiles (93 Astro Viper's), red knife (88 Shockwave's), red figure stand (common). MAJOR BLUDD received initial military training in the Australian Special Air Service but left to join the French Foreign Legion. He then worked as a military advisor in a number of hostile countries where he committed acts of terrorism against peaceful governments throughout Europe. He is still wanted for crimes originating in Rhodesia and Libya and is currently considered one of the world's most dangerous fugitives. Proficient with every form of infantry weapon currently in use, Bludd also has a tactical mind like a steel trap...and a face that looks like it was caught in one! "Throw another Joe on the barby, mate." Accessories: black laser rifle (91 Maj. Bludd's), black figure stand (common). Toy Notes: Carded in a two-pack with Rock Viper. Item #57756. Accessories: graphite grenade launcher (91 Zap's with no muzzle), graphite tank cannon (91 Zap's). MAJOR BLUDD received initial military training in the Australian Special Air Service but left to join the French Foreign Legion. He then worked as a military advisor in a number of hostile countries where he committed criminal acts against peaceful governments. He is still wanted for crimes in several countries and is considered one of the world's most dangerous fugitives. Proficient with every form of infantry weapon currently in use, MAJOR BLUDD also has a tactical mind like [a] steel trap and a face that looks like it was caught in one! "Throw another G.I. Joe on the barby, mate." Toy Notes: Carded in a Toys 'R Us-exclusive set with Cobra Rock Viper, Cobra Laser Viper, Cobra Lamprey, Cobra S.A.W. Viper, and Cobra H.E.A.T. Viper. Item #53400. Accessories: dark grey pistol (05 Bombstrike's), grey pump-action shotgun/missile launcher with two pins on top and L-shaped stock (new), black soft flared helmet with severe widow's peak and red Cobra emblem (new), red folded scarf with centered corners (new). "The G.I. JOE team ain't so tough. I'd drop them in the outback with just a canteen between them, and they'll be begging for me to rescue them within two days." Accessories: dark grey rifle and bipod (03 Black Out's), dark grey Uzi with folding stock (05 Snake Eyes's), clear figure stand (common). MAJOR BLUDD received his initial military training in the Australian Special Air Service but left to join the French Foreign Legion. He then worked as a military advisor in a number of hostile countries where he committed criminal acts against peaceful governments. He is still wanted for crimes on three continents and is considered one of the world's most dangerous fugitives. Proficient with every form of infantry weapon currently in use, MAJOR BLUDD also has a tactical mind like a steel trap but continues to write really bad poetry. His rhymes even get rejected from prison newsletters! A mercenary's job is a heartless one, and MAJOR BLUDD continues to prove that his heart was lost long ago. He has been on the COBRA payroll numerous times, but it's his freelance activities that have given him the "bad" reputation. His latest endeavor calls for him to recruit an international group of the most cutthroat soldiers-for-hire, send them to the four corners of the world to track down the latest location of SGT. SLAUGHTER's secret training base, and remove the drill instructor - permanently. "When you see me, you better run...because chasing you down is half the fun!" Toy Notes: Boxed in a Convention-exclusive set with Cobra Mortal, Overlord, six copies of Skull Squad Trooper, and six copies of Coil Trooper. Accessories: black small pistol-shaped missile launcher with posts on front for missile (new), four small black missiles with three fins on back (new), silver dog tag necklace (new), black square backpack with ridges on all sides and slots for missiles (new), black Cobra figure stand. 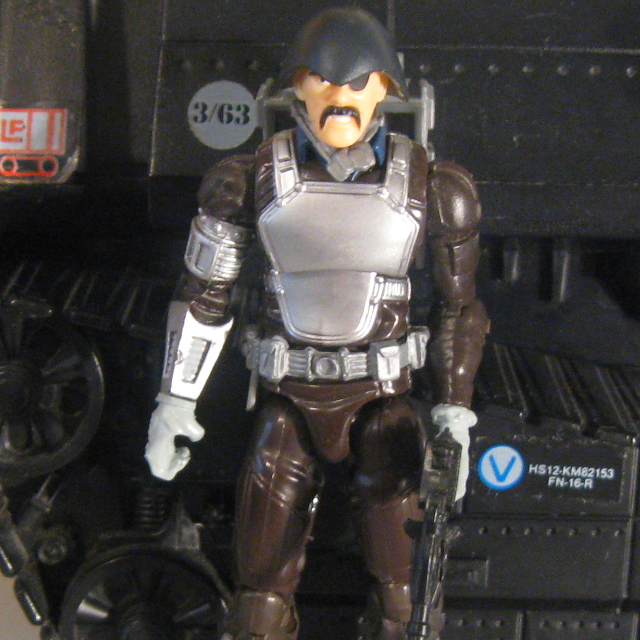 MAJOR BLUDD received initial military training in the Australian Special Air Service. Later joined the French Foreign Legion. Worked as military advisor in a number of countries and is currently wanted for crimes in Rhodesia and Libya. Proficient with every form of infantry weapon in current use. MAJOR BLUDD has a tactical mind like a steel trap. Qualified Expert: All NATO and Warsaw Pact small arms. Toy Notes: Item #29254. Originally intended for release with Wave 7 but delayed. Appeared in stores with late shipments of figures from previous waves 1-2 weeks before the appearance of Wave 8 proper. Accessories: black launcher pistol (08 Maj. Bludd's), four black missiles (08 Maj. Bludd's), silver belt (08 H.I.S.S. Driver's), dark silver dog tags (08 Maj. Bludd's), silver backpack (08 Maj. Bludd's), black Cobra figure stand. MAJOR BLUDD received initial military training in the Australian Special Air Service, and later joined the French Foreign Legion. He worked as military advisor and is currently wanted for crimes in several countries. He is proficient with every form of infantry weapon in current use. He has a tactical mind that can calculate and anticipate multiple strategies to achieve the most effective outcome. As a mercenary, he hires himself out to the highest bidder, although he particularly enjoys working for COBRA COMMANDER, whose corrupt nature closely matches his own. "Heroic fools like the G.I. JOE team are easily defeated because they limit their actions to those that they deem honorable, whereas I, having no such moral restrictions, will use any means necessary to reach my goal." Toy Notes: Boxed with Snake Eyes, Cobra Commander, Quick Kick, M.A.S.S. Device transport chassis, and The Pyramid of Darkness DVD. Item #33560. Accessories: black launcher pistol (08 Maj. Bludd's), four black missiles (08 Maj. Bludd's), black belt with silver buckle (08 H.I.S.S. Driver's), dark silver dog tags (08 Maj. Bludd's), tan scarf (08 Beachhead's), black backpack (08 Maj. Bludd's), black Cobra figure stand. MAJOR BLUDD received initial military training in the Australian Special Air Service, and later joined the French Foreign Legion. He worked as military advisor for a number of governments and is currently wanted for crimes in several countries. He's proficient with every form of infantry weapon in current use and has a tactical mind like a steel trap. He has received extensive training in extreme environmental conditions and currently leads an advanced COBRA assault squad in an undisclosed desert region. "The G.I. JOE team ain't so tough. If I dropped them in Outback with just a canteen between them, they'd be begging me to rescue them inside of two days." Toy Notes: Sold in an online-exclusive boxed set with two copies of Crimson Guard, Cobra Officer, and three versions of Cobra Trooper.